More than 10 years ago the Human Genome Project produced an almost complete list of the 3 billion pairs of chemical letters in the DNA that embodies the genetic code – but nothing about the way this blueprint works. Now, after five years of concerted effort by more than 440 researchers in 32 labs around the world, working collaboratively in the ENCODE Project, the first holistic view of how the human genome actually does its job has emerged. During the ENCODE study, researchers found that more than 80 percent of the human genome sequence is linked to biological function and they mapped more than 4 million regulatory regions where proteins specifically interact with the DNA with exquisite specificity; these findings represent a significant advance in understanding the precise and complex controls over the expression of genetic information within a cell. “During the early debates about the Human Genome Project, researchers had calculated that only a few percent of the sequence encoded proteins, the workhorses of the cell,” said Eric D.
The CNAG researchers Tyler Alioto, Colin Kingswood, Paolo Ribeca and Micha Sammeth, leaded by Roderic Guigó from the Centre de Regulació Genòmica (CRG), contributed to the project working together with the ENCODE RNA sequencing analysis working group. More specifically they helped setting up methods to process and understand the huge amount of RNA sequencing data produced by the ENCODE project. 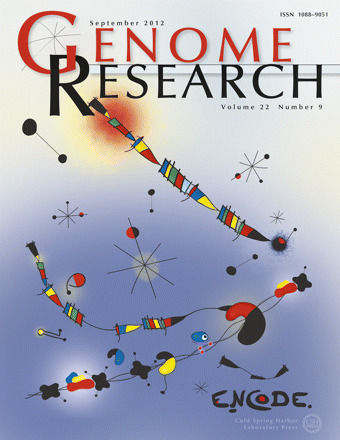 Genome Research's cover was inspired by the work of Miró.